The Barton Creek Greenbelt is an urban oasis. Bordered by the Central Business District, where Barton Creek empties into Town Lake, it winds 7.8 miles upstream into the open countryside of southwestern Travis County. The Greenbelt begins at Zilker Park, just above Barton Springs Pool, and passes through Gus Fruh District Park near Loop 360. 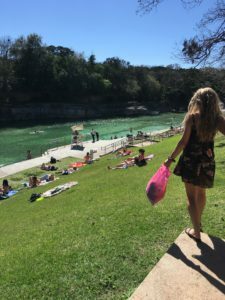 While Barton Springs flows year round, Barton Creek flows primarily during the rainy spring and fall seasons. The clear-running creek rushes over rocks and boulders and is punctuated occasionally by small waterfalls. During dry seasons, the creek disappears underground into the Edwards Aquifer, leaving a few spring-fed waterholes separated by miles of parched white limestone. 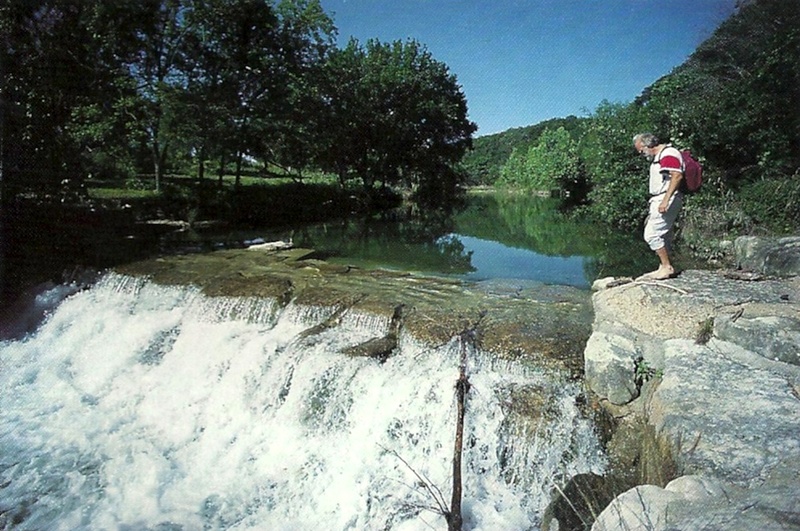 Barton Creek carves its way through the Edwards Plateau, the southern extension of the Great Plains. The Edwards Plateau consists of thick limestone beds deposited by a shallow sea about 100 million years ago. Water easily dissolves this limestone, creating caves and giant pure reservoirs underground and sculpting networks of canyons and valleys at the surface. 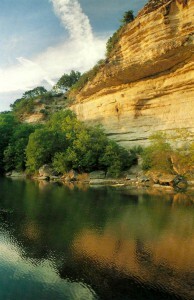 Barton Creek is flanked by soaring canyon walls and overhanging rock bluffs carved over hundreds of thousands of years. The canyon’s dense vegetation and steep canyon walls make visitors feel isolated and far from a major city. Inside the Greenbelt, you can find many species of native plants, birds, mammals, reptiles and insects. 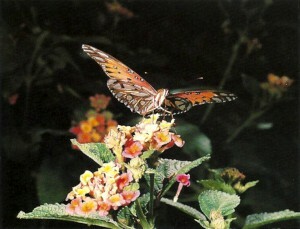 There are more types of butterflies here than at any other spot in Central Texas. There are grasslands and woodlands, and colorful varieties of birds whose songs reverberate against the canyon walls. But the Greenbelt isn‘t a zoo, so a bit of caution is called for: rattlesnakes, scorpions, and fire ants live here, too. There are plenty of things you can do along the Barton Creek Greenbelt: hike, bike, climb, canoe, swim or kayak. You can picnic by the creek, look for butterflies and birds, or just enjoy the scenery. Major access points include Zilker Park, Gus Fruh District Park, Barton Skyway, Capital of Texas Highway (Loop 360) and Camp Craft Road. Much of the greenbelt is rugged, but the rewards of this urban oasis can make the effort worthwhile. It is the most beautiful and at the same time the most sublime scene I ever saw . . . The atmosphere was charged with the most delightful perfume and every shrub and every hill and every flower seemed to extend a welcome to the weary traveller. The Barton Creek watershed is alive. Walk along Barton Creek and you’ll hear the calls of mourning doves and the rhythmic tapping of woodpeckers. You might see a blaze of crimson as a cardinal glides among the live oaks and cedar, spot a red-tailed hawk hunting its next meal, or chuckle at the sight of a squirrel bounding from limb to limb. In spring, you’re surrounded by patches of fragrant bluebonnets, Indian blankets and delicate buttercups. Each of these living things is like a cell in a human body; each species, an organ. Destroy one cell, and the body recovers. Destroy one organ, and the body is damaged, perhaps beyond repair. Like the human body, the ecosystem nestled among the hills of southwest Austin is dynamic and hardy. It changes over time. Variations in climate might force one species to leave the area, but another will find the new conditions quite hospitable. It can resist some tampering from the outside, with the delicate balance among species shifting to maintain the overall health of the ecosystem. Yet too much tampering – polluted water, increased soil erosion, more pavement or the introduction of a ferocious new organism (such as the fire ant), can ravage the ecosystem. Today, the area still is a naturalist’s dreamland of hundreds of species of plants, mammals, fish, reptiles and invertebrates. Some are found no farther west than Austin. Some are quite rare. A few are found nowhere else on Earth. A cursory glance at the area delivers one overwhelming impression: green. The hills are thick with many species of oaks and elms, as well as ash juniper (better known as cedar) and hackberry. Open areas are covered with wild grama or bluestem grasses. 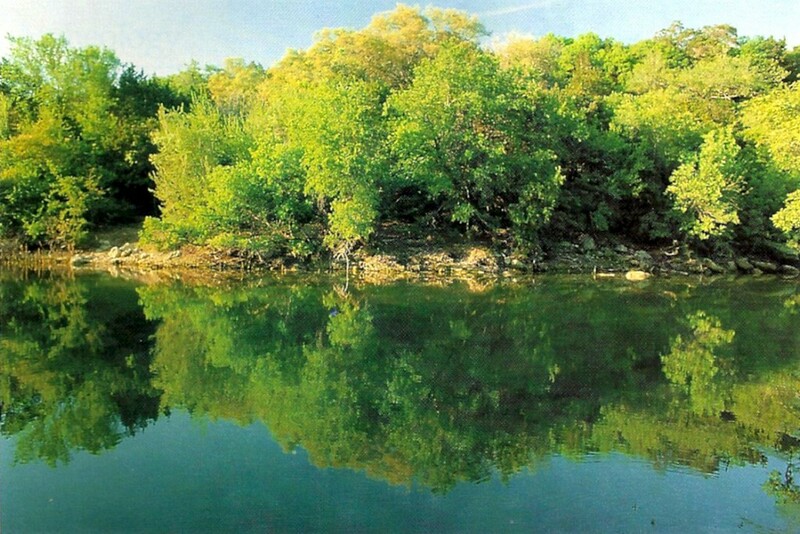 Creekbeds and springs are surrounded by cottonwood, pecan, elm, willow, chinaberry, redbud and many other species of trees, along with an abundance of shrub and wild-grass species. Each of these plant species harbors birds, mammals and insects. The gult fritillary, Agranlis vanillae, is a tropical butterfly that is common on Barton Creek year round. Hundreds of these and other butterflies used to gather at mudpuddles, to drink from the mud or damp sand. Since 1885, these gatherings have become smaller or vanished altogether. This may be due to increased runoff from commercial chemical lawn treatment over the same period. 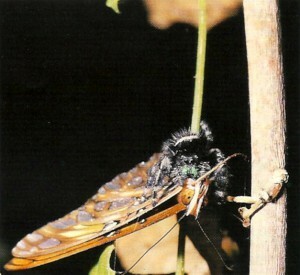 A jumping spider, Phiddipus andax, pounces on a gult fritillary, killing it by injecting venom. Jumping spiders don’t spin webs to catch their prey. Instead, they rely on their acute vision and seemingly intelligent methods of attack. Notice the eyes gazing raptly at the camera and the iridescent green fangs. The golden-cheeked warbler, Dendroica chrysoparia, nests in the cedar woodlands of the Texas Hill Country, after wintering in Mexico and Central America. Biologists estimate that 40% of the warbler habitat (mature cedar woodlands) that existed in 1979 was destroyed by 1989. Among the many plants that live in the creeks and springs are a variety of ferns, coontail, water primrose, wild celery and cattail. Of course, the water in Barton Creek and other creeks, springs and ponds is the centerpiece of life in the area, sustaining the deer, rabbits, bobcats, foxes, raccoons, field mice and other mammals that inhabit the rocky countryside. It’s home to frogs and turtles. Fish and insects living in creeks and ponds attract myriad species of birds, from great blue herons to spotted sandpipers. It’s obvious, then, that each portion of the ecosystem depends on other parts for survival and population control. If the bobcat and predatory birds that inhabit the region disappear, populations of small mammals could run wild. If one clump of trees is destroyed, some critical habitat for a bird species may be affected. 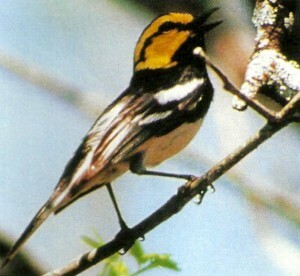 For example, the golden-cheeked warbler inhabits steep canyons in part of the Barton Creek basin. Because it uses cedar bark that is more than 20 years old to make its nests, when mature cedar woodlands are destroyed, the species has nowhere to nest and rear its young — and could face extinction. The warbler also faces danger from the cowbird, which lays its eggs in the warblers’ nests, displacing the warbler chicks. Several other rare or endangered species inhabit the basin. Two species of eyeless arachnids, called harvestmen, are found in the caves on Barton Creek, along with at least four other rare invertebrates. Barton Springs itself is home to two rare, blind snails, and a two-inch long salamander first seen in Barton Springs Pool in the 1940‘s is unique to Barton Springs. There are also rare plants in the basin. 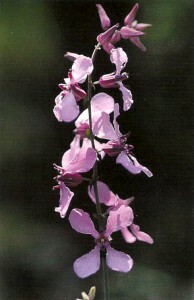 The endangered bracted twistflower is found infrequently on rocky wooded slopes in the upper reaches of Barton Creek. The Barton Springs salamander, (Eurycea sp. 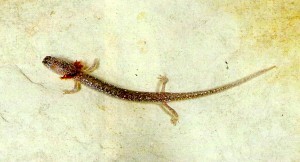 ), is a small amphibian found only in the Barton Springs water system. Most salamanders spend their juvenile period in an aquatic form, then metamorphose into an adult form that lives on land. The Barton Springs salamander, however, retains its aquatic characteristics throughout life. The red plumelike gills, visible just behind the head, are used tor breathing. They are an example of the salamander‘s adaptations for life in the water. The Barton Springs salamander is rarely seen because most of the population lives below ground in the water filled caves of the Aquifer. Native to south central Texas, but very rare and endangered throughout its range, the bracted twistflower, Streptanthus bracteatus, can be found infrequently on rocky wooded slopes above Barton Creek. Travis County has many endangered species because it is a crossroads of several distinct ecosystems – the Edwards Plateau, the Blackland Prairies, the Crosstimbers and the Prairies. A transition zone, the Balcones Canyonlands, lies west of the Balcones Fault Zone, which runs north—south through Austin. Canyons and mixed woodlands of ashe juniper (cedar) and oak separate the Blackland Prairie from the Edwards Plateau to the west. Many areas are “karst” terrain, which contains caves, sinkholes, and other solutional features. The rare species have survived many climatic changes. The climate was cooler and wetter long ago, but when it dried out, some species were left stranded on limestone hills, in caves or in cool canyons. These isolated species evolved into distinct forms adapted to their specific habitats. This is especially true of the numerous cave species, which are isolated in cave islands within the limestone. Many cave species have lost their eyes and pigment over thousands or millions of years. Waterfalls on upper Barton Creek are more dramatic during the rainy spring and fall. The serenity of the Hill Country is reflected in the waters of Barton Creek. 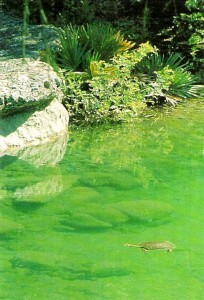 A sottshell turtle floats in the quiet waters of upper Barton Creek. About 800,000 people visit Barton Springs Pool each year. A kayaker negotiates a tricky whitewater passage while friendly spectators look on. 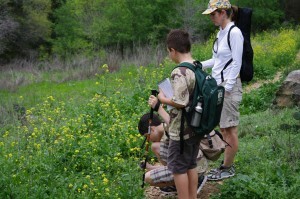 The wooded hills, springs and creeks provide a natural classroom for teachers and students to enjoy. 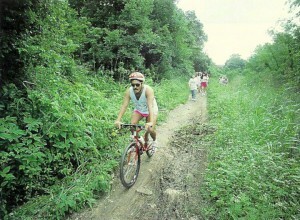 The Barton Creek Greenbelt provides many opportunities for biking and hiking.